Activate your vintage bass without compromising that old-school sound. This active 4-string pickup for Jazz Bass, PBass, and P-J configurations was designed to meet the needs of today's modern bassist who insists on an authentic, "original" look. The vintage pole piece design doesn't suggest that there's a highly sophisticated preamp under the cover, but there is. For Jazz Bass, the bridge pickup has smooth highs and a solid bottom for warmth and clarity. The focused midrange gives the kind of definition vintage pickups are so famous for. The neck pickup is fat and present with enough punch and snap to give the "E" string brilliance and definition. 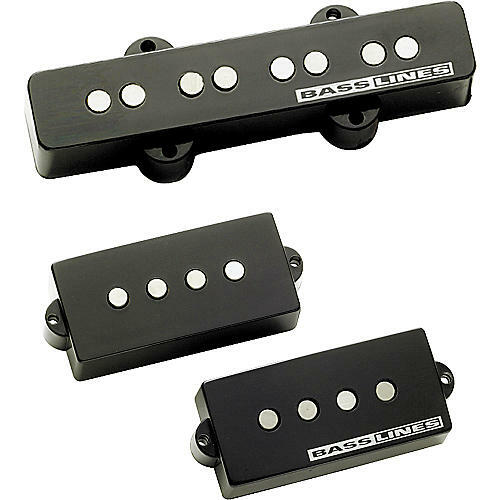 The P-Bass replacement pickup is fat and present with those famous "warm-and-woody" mids that P-Bass players adore. The fully discrete, ultra-quiet, single battery preamp delivers low impedance output with excellent dynamic range. As a result of the micro power circuit design, you can enjoy up to 2,000 hours of continuous battery life. These pickups are direct replacements and require no guitar modification. A wiring diagram and all necessary mounting hardware, pots and battery clip are included.